Budget - Consider how much you're comfortable having your guests pay for a 3 night vacation. Typically, budgets start at approximately $800 per person for a 3 night, all-inclusive vacation including air, hotel, transfers, meals, drinks, tips and taxes. Remember though, you get what you pay for. Dates - Your wedding date will determine how much the trip will cost. Guests - Don’t be upset if not everyone on your guest list can join you due to time or money constraints. Generally, about 40% of those you invite will be able to attend your destination wedding. Most couples have a reception back at home to celebrate with those who were unable to attend. Destination - Try to keep travel times within reason. For example, you won't want to plan a Hawaii wedding if guests need to fly for 9 hours and can only stay for 3 nights. Likewise, the more exotic islands can often require multiple airline connections to get there. All guests will need a passport. Most resorts will require the bride, groom and witnesses to arrive 3 full days prior to the wedding ceremony. Resort - Do you envision something small and intimate, or something loaded with activities and energy? We highly recommend all-inclusive resorts that include meals and drinks. This makes it so much easier for your guests to budget for their trip. 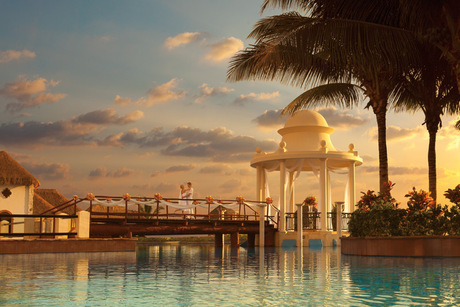 And, many all-inclusive resorts include a semi-private reception with their wedding packages, which saves you money. Perhaps money that could be spent on a nice upgrade to the honeymoon suite! Ceremony Location - Beach, gazebo, garden, chapel? Resorts usually have many options for you to choose from based on your desires and number of guests. Resorts also have a back up plan and location in case of inclement weather. Ceremony Type - There are two types of ceremonies for destination weddings. You can have a LEGAL ceremony, where you are legally married in your destination and receive a marriage certificate that is recognized at home. Legal ceremonies often cost a little more and require extra paperwork and occasionally blood tests. Or, you can have a SYMBOLIC ceremony that has no legal holding. To have a symbolic ceremony, you would be legally married at home by your clergy or courthouse before you travel. At your destination wedding, you will celebrate your union as if it were your actual wedding with flowers, music, vows and other ceremony details. Your guests will not know the difference between a legal and symbolic ceremony. Approximately 80% of all destination weddings are symbolic.